Enjoy the top 1 famous quotes, sayings and quotations by Russell Cornell Leffingwell. There can be no freedom of the individual, no democracy, without the capital system, the profit system, the private enterprise system. These are, in the end, inseparable. Those who would destroy freedom have only first to destroy the hope of gain, the profit of enterprise and risk-taking, the hope of accumulating capital, the hope to save something for one's old age and for one's children. For a community of men without property, and without the hope of getting it by honest effort, is a community of slaves of a despotic State. Want to see more pictures of Russell Cornell Leffingwell quotes? 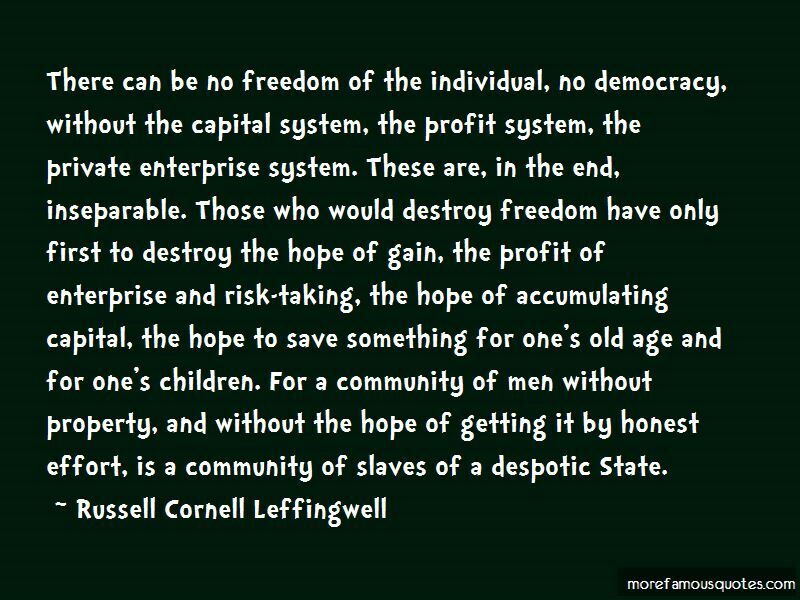 Click on image of Russell Cornell Leffingwell quotes to view full size. “Through our scientific and technological genius weve made of this world a neighborhood. And now through our moral and ethical commitment we must” — Martin Luther King, Jr.